"I pay just 10 cents per kWh for electricity." This is something I hear quite often from homeowners in New Jersey. Happy and content because they are paying such a low rate for power. But are you really paying 10 cents. The answer is "NO". So, How much are your playing for electricity ? Read on for answers. The 10 cents is the price of the Supply or Generation of electricity. What is conveniently forgotten is that you also have to pay for Delivery of electricity. The delivery charge is another 5 to 12 cents. New Jersey home owners pay between 15 and 22 cents per KWH of electricity. YES your electric rate is between 15 cents and 22 cents. Utility companies tend to charge you higher during summer when you use more electricity. That ensures maximum revenues during the peak months. Every electric bill has two charges - 1) Delivery charge and 2) Generation or Supply charge. Utility companies often refer to the Generation or Supply charge on their bills and refer to the rate they charge for this part. That is usually around 10 cents in NJ. 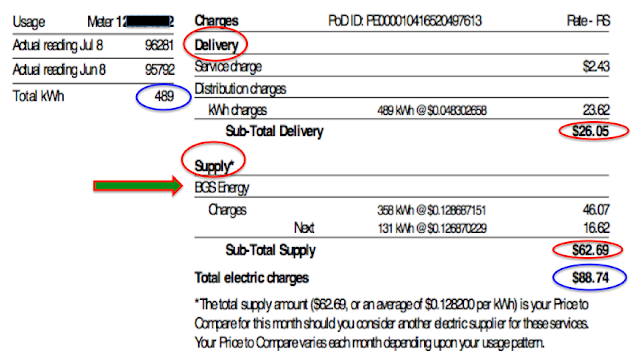 Lets look at the delivery and generation/supply charges in actual electric bills. Here is a PSEG bill followed by a JCPL bill. The items circled in red show you the Delivery and Supply/Generation charges in each bill. JCPL calls it Generation and PSEG calls it Supply. The items circled in blue show total electric charges for the month in $ and the total amount of electricity consumed in the month in KWH. The amount you pay every month is the the total of the Delivery charges + the Supply/Generation charges. Solar can help you reduce your rate to around 10 - 11 cents per KWH down from the 15 - 22 cents that you might be paying today. 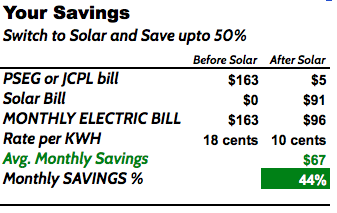 Switching to solar eliminates both the Delivery and the Supply/Generation charges from PSEG and JCPL. A properly designed solar system will reduce your utility bill from JCPL or PSEG to an average of $5 or less per month in total. You will get a new electric bill from the solar company which will be lower by 40% or more than your JCPL or PSEG bill. Read my blog on the solar lease and see how we have helped homeowners save 40 to 50% off their electric bills by switching to solar power. The switch is easy and does not cost you anything; you just move to much lower electric bills. Utility companies allow you to choose a third party for your Supply/Generation service. 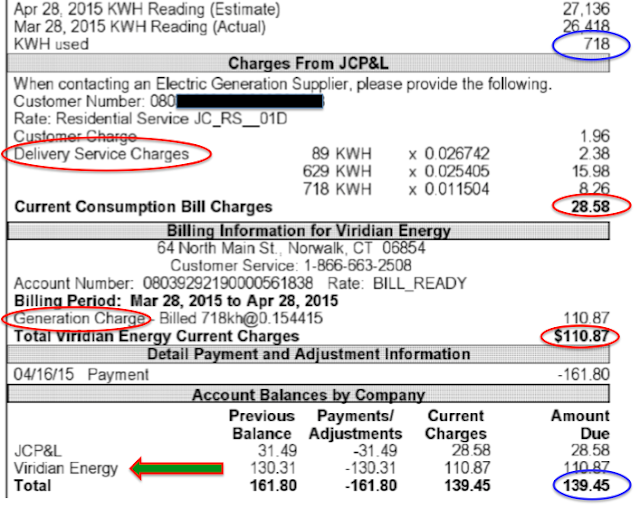 Viridian Energy is the third party on the JCPL bill shown above and BGS Energy is the third party on the PSEG bill. Using a third party gives you short term savings but they usually tend to charge more after the initial honeymoon period. Keep a close watch on what the third party is charging you. If you are not careful, you might end up paying more what JCPL or PSEG would charge for Supply/Generation. If you don't want the aggravation of looking at your bill every month, it is best to just have JCPL or PSEG be the provider for both Delivery and Supply/Generation, or better still make the switch to solar.